How Much is an Awning? The average patio awning can cost anywhere between £150 and £4000. An ‘off the shelf’ budget awning typically costs between £150 and £500, while high-end, bespoke awnings cost between £2000 and £4000. Expect to pay around £300 extra for electric operation, and a little more for remote control. These costs exclude installation, which can cost £400 and £800, depending on the product and warranty offered. If your property requires special brackets, such as spacers to spread the weight load, you may also need to pay a little more. While ‘off the shelf’ and bespoke awnings each serve a purpose, it is important to note you cannot compare their prices as they do not offer like-for-like quality. Read on for an indication of awning prices and the differences between the different types. ‘Off the shelf’ awnings are usually manufactured in China, before being sold online by UK retailers (including awning specialists and national chain stores) for as little as £100. They are manufactured in specified sizes to reduce production costs, usually in 0.5m intervals. Because they arrive in the UK readymade, there are no customisation options, and fabric colours are often restricted to one or two options. The components, particularly the fabrics, arm mechanisms and motors, are low to medium quality and therefore suitable for occasional short-term use only. Find out more about the differences on our awning prices page here. Bespoke awnings offer a completely buying experience. Prices start at £1000, because each design is made to order by European specialists such as Markilux and Weinor. They are sold through official UK partners, who to tailor each awning to an owner’s exact requirements. The buying process usually involves a survey to assess the property and discuss the hundreds of customisation options. These awnings are a bigger initial investment but benefit from much higher quality components and longer guarantees. All prices vary dependent on model. ‘Off the shelf’ awning suppliers sometimes offer very basic budget models for as little as £100, while bespoke awning suppliers offer contemporary designs which have won prestigious awards for £4000+. Expect to pay more for a protective cassette enclosure with the cheaper awnings. The price distinction between open and cassette designs is not as obvious with high-end awnings, which tend to be priced based on design aesthetics instead. Size plays an important factor in awning pricing. Whatever your budget, larger sizes (widths and/or projections) will cost more. The biggest awnings (anything over 5m wide and/or 3m projection) are usually only achievable with a high-end bespoke design, because they are strong enough to support the extra weight. Both cheap and high-end awning specialists offer optional sensors for electric awnings. These retract the awning to protect it if wind speed picks up, or ensure it is always extended on a sunny day. £350 will get you a top-of-the-range sensor from an internationally-renowned manufacturer, although cheaper options are available too. Integrated lighting and heating can be a substantial surcharge, but may well be worth it if it means using your awning more. Special fabrics, such as those which have been waterproofed or sign written, will also cost more. Some awnings come with a valance as standard, whereas with others it costs extra. Remember to ask about VAT, installation and delivery. 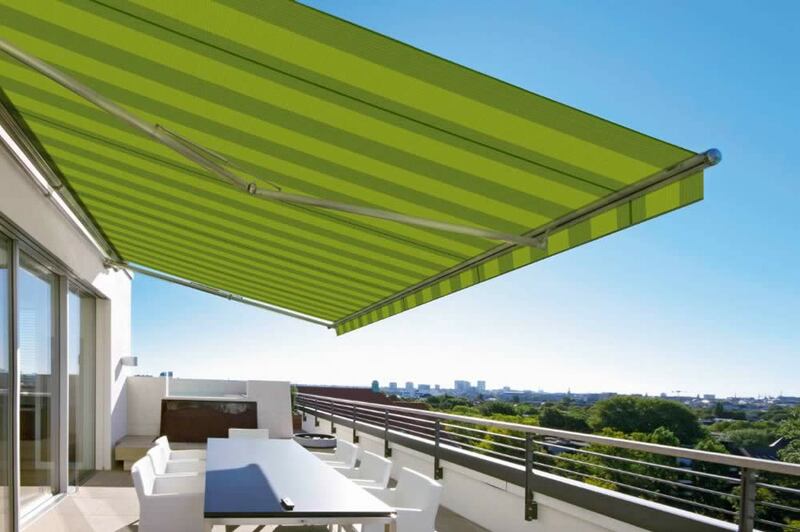 Roché’s patio awning prices are all listed both with and without VAT, and a set surcharge applies for installation and delivery. Speak to the team to request a quotation.